Almazorre, lies on the road from Ainsa, over Arcusa to Barcabo. The village is on the right side just after the collado de Eripol. 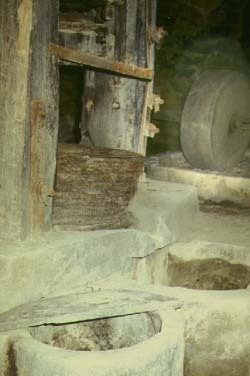 The mill is situated below the village on the rio Vero. The left side of the building is an harinero with two cárcavo's. The wheels were gone and replaced by litter. Although I could find the azud (dam) and parts of the canal, the connection to the cárcavo was lost due to recent digging. The right part is the aceitero with a spacious fire place, a ruello and a compact prensa. The prensa is of wood for the greater part. Unlike Castilsabás it has no big lever. The caracol acts directly on the esteras. 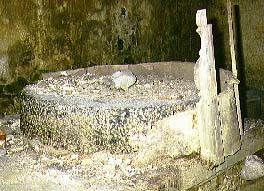 Visit Mipanas for an overview of this type of press. Two wheels rest above the empty cárcavos. 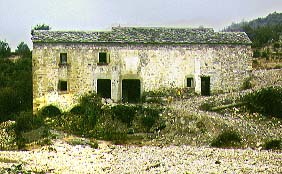 The guardapolvo has fallen apart. The outlet to the farinal is marked with AÑO 18IX.